Home > ADVERTISEMENT > Perfect Yom Tov Gift – PearlGirl 14K White Gold Freshwater Button Pearl and Diamond Earring From Only $87.99 + Free Shipping! Perfect Yom Tov Gift – PearlGirl 14K White Gold Freshwater Button Pearl and Diamond Earring From Only $87.99 + Free Shipping! 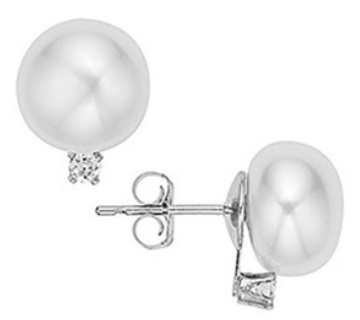 September 13, 2018 Comments Off on Perfect Yom Tov Gift – PearlGirl 14K White Gold Freshwater Button Pearl and Diamond Earring From Only $87.99 + Free Shipping! Get these PearlGirl 14K White Gold Freshwater Button Pearls and Diamond Earring for only $87.99 – $95.99 + Free shipping (price depends on size)! Sparkling Genuine Diamonds (H-I, I2) 10pt. (total) and High Luster AAA Quality Cultured Freshwater Pearls, with 14k Gold Solid Post & Safe Ear-backs. Most Wanted Gift for you Loved Ones, Wife, Mother, Daughter & Friend! Perfect for any Occasion. Mother’s Day, Holiday, Birthday, Anniversary! Make this Earrings a lovely addition to your jewelry box.